A few days ago I had the pleasure of photographing a happy couple for their wedding announcement in The New York Times. I had to do some research on the subject before planning our photo shoot. As it turned out, submission requirements and guidelines are very specific but not that complicated. 4) Remember, couples posing for pictures should arrange themselves with their eyebrows on the same level and with their heads fairly close together with plenty of space at the top and sides of the couple’s heads. 5) The Times does not charge for publishing these reports, but space is limited and they do not guarantee publication. And we made it to The New York Times! 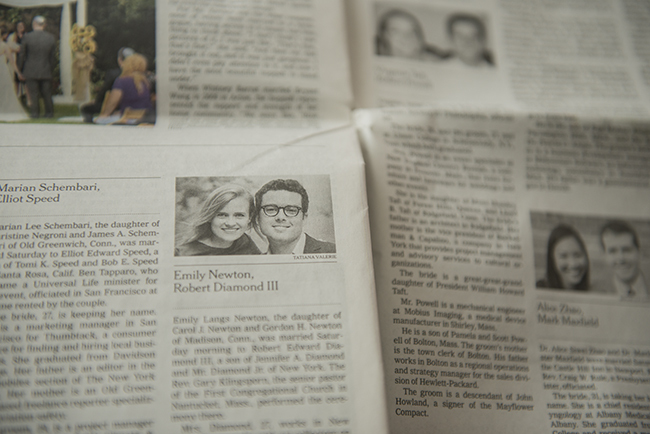 A printed wedding announcement was published on Sunday, October 5th in Sunday Styles section.